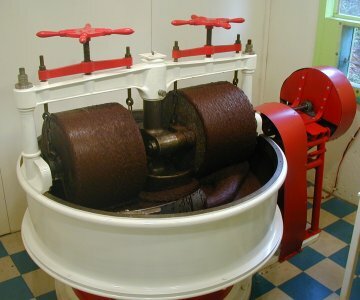 We use a European vintage chocolate grinding machine called The Melangeur. It’s basically two giant revolving granite rollers on top of a revolving granite slab. The intense grinding action of the heavy rollers tearing across the slab as they rotate converts the cocoa nibs (roasted bean pieces) to a thick oily paste and finally a thick liquid. Heat is added to the machine to facilitate the liquification. 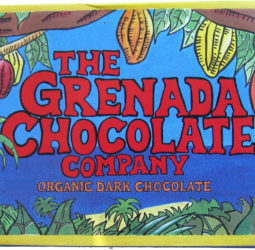 The resulting thick cocoa bean liquid is called cocoa “liquor” and is over 50 percent fat. It is either used at this stage for cocoa butter pressing or is mixed and re-ground with sugar in the Melangeur to make chocolate. We refurbished our antique Melangeur, adding a solar-powered drive system.